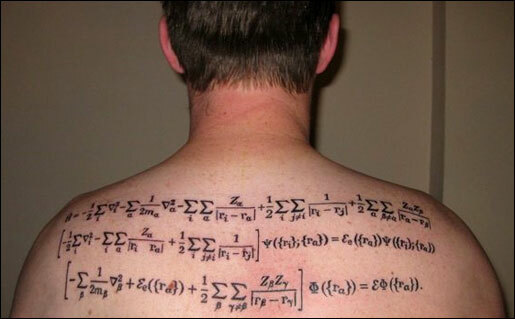 Tattoo Blog » Quantum Mechanics. Tattoo Blog » Inspired » Quantum Mechanics. You know, speaking of misspellings in tattoos, I had to wonder about what the consequences would be if there were a misspelling in, (arguably), the ultimate science geek tattoo. The tattoo is made up of three physics equations, and that comes out as so much Greek to me, but basicly the first is the Born-Oppenheimer approximation. A way for physicists to calculate two different parts of a molecule. It’s energy, and it’s wave function. The second eye bender is the same thing, but expressed as a 3-Dimensional Schroedinger Equation instead, according to Joe, the owner of the tattoo. The last line is the solution of either equation in the form of a Schroedinger Equation. Joe, I’ll take your word for it. Considering the tattoo has it’s roots in Quantum physics though, I have to wonder. If the artist got any part of the equations wrong……does that mean reality as we know it is gonna collapse, or would he accidentally find the correct equation for creating wormholes? Either way, congrats on getting one hell of a tattoo, and honestly earning the title of “The Ultimate Science Geek Tattoo”. Our fellow science tattoo fiends are going to be hard pressed to top that one!